First off, you're going to need a twisting wrench (and a vise to hold the stationary end of the metal to be twisted). Twisting wrenches come in two basic flavors: fixed and adjustable. A fixed twisting wrench is an easy tool to make. Using 1/2" square stock, the bar is bent back and forth in the shape of a flattened "Z". 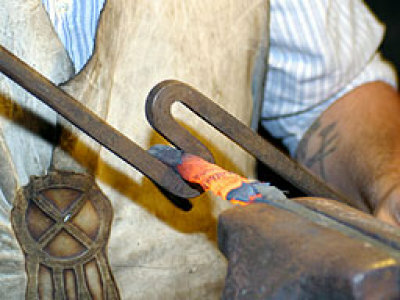 One throat is sized to twist 1/4" stock and the other is sized for 3/8" stock. The adjustable twisting wrench is usually a monkey wrench with a bar welded to the top of the tool. with this style is that it only fits one size of rod. of metal you want to twist. (Personal note: The Appalachian Blacksmiths Association thinks the Z twisting wrench is 10 times better than the adjustable type. I doubt it since an adjustable wrench is capable of infinite adjustment, within limits, to make a better grip. However, metal cools while you are fiddling with the adjustment, so ...). 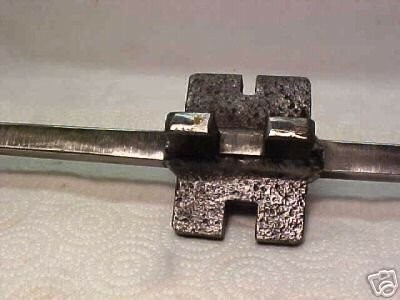 This is a different kinda twisting wrench that I just came across. I like the idea that it will accomodate up to four different sizes of stock. This ought to be more than enough for most people, so you might want to consider it. It was last sold on eBay in 2007 so you'll have to make your own. At times I seem to want more to build tools than use them. 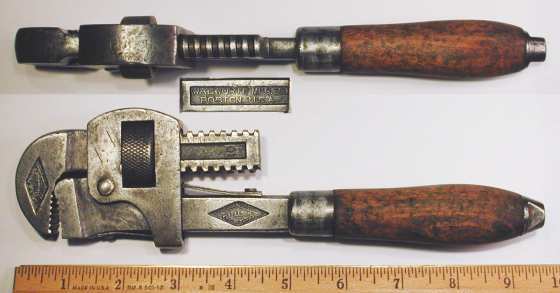 Since some of the products I sell have decorative twists to make them appear less mundane, I thought I'd share my favorite twisting wrenches and some hints on making your own. These are my twisting wrenches. The non-monkey wrench is one that I bought. It looked neat, but it's limited in the sizes it can handle well. The other three I made to handle different tasks. The really big one is for twisting railroad spikes. The smallest one is for twisting ¼" or smaller. 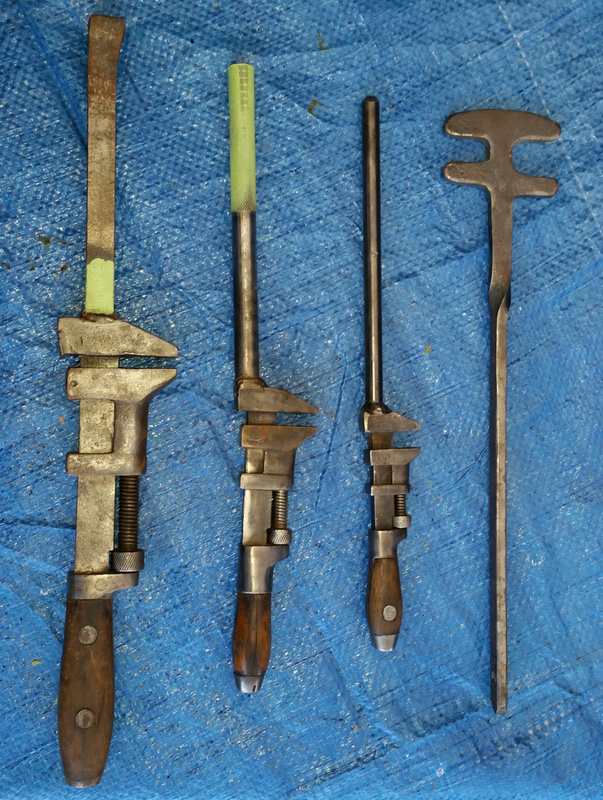 The middle one is my "go-to" wrench for everything else. I managed to find an old socket wrench handle, hence the knurled end, so I welded that to the monkey wrench. 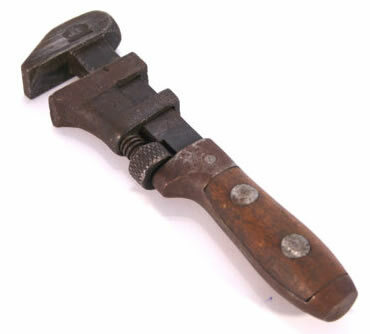 The handle on the small wrench is ½" steel rod. The handle on the big one is ¾" square steel rod. 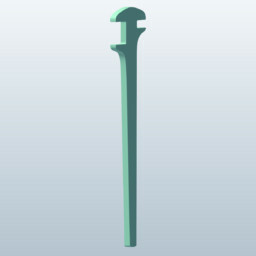 The middle is 11⁄16", but as I said it was a discarded socket wrench handle. Perfect example of what not to use. I don't use any monkey wrench where the top of the wrench moves as you turn the knob. This is because the top of the head isn't stable and can cause problems when twisting because it is loose. I use only monkey wrenches where the bottom of the head moves relative to the top of the head. They are much more stable when twisting. When building a twisting wrench my first stop is Kent's Used Tools. There I can usually find an old monkey wrench or two. I prefer the ones with wooden handles. The wood doesn't transfer the heat from the metal being twisted and if you take the time to clean it up it looks a whole lot better. What I use for the "secondary handle" depends on how big the wrench is and what I'm going to be twisting. It also depends on what I have laying around. Generally, I use ½" or bigger solid bar. Round is more comfortable in my hand, but if I'm going to be twisting heavy stock I'll gravitate towards square. Since Kent's has used socket wrenches, I may treated myself to one with a knurled end for extra grip. After that I just weld the secondary handle to the head of the monkey wrench. A little touch up with an angle grinder and flap wheel and it's ready to go.